View More In Threshold & Wheelchair Ramps. BHR 1110 GG Color: Granite Grey Features: -Includes molded flares and traction pads for safety. 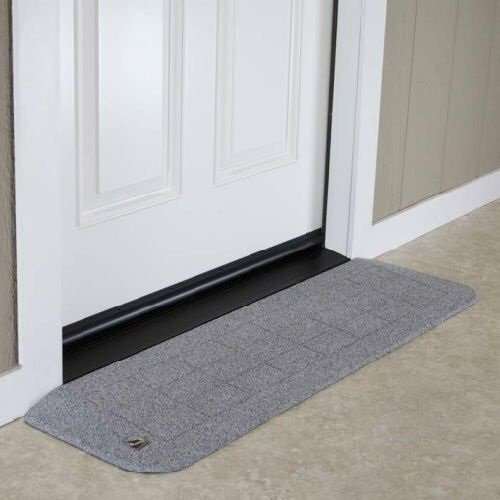 -First patented 100% recycled lightweight plastic threshold ramp. -Safest surface in threshold design, much safer than aluminum. -Peel-and-stick tape for immediate installation. -Perfect for wheelchairs, scooters and electric chairs. -Can be vertically cut for height adjustment and notched to accommodate door jambs. Product Type: -Threshold ramp. Bariatric: -Yes. Primary Material: -Plastic. Outdoor Use: -Yes. Weight Capacity: -4000 Pounds. Country of Manufacture: -United States. Dimensions: Ramp Rise: -1.25". Overall Width - Side to Side: -42". Overall Ramp Length - Front to Back: -1.02 Feet. If you have any questions about this product by SafePath Products, contact us by completing and submitting the form below. If you are looking for a specif part number, please include it with your message.